KoopaTV: Almost-Christmas Murder Cases Stun Los Angeles! Miles Edgeworth objecting to being declared Not Guilty, due to his long-held belief. With regards to the 11:50 PM December 24 murder of Robert Hammond, the prosecution painted a picture where Miles Edgeworth took Robert Hammond out in a boat in Gourd Lake, and shot him close-range with a pistol. However, due to the fierce and unprecedented cross-examination by Mr. Edgeworth's lawyer, Phoenix Wright, Mr. Wright was able to prove the time of death and the possibility of another shooter: The aloof boat caretaker. Mr. Wright was then able to prove the true identity of the caretaker: Yanni Yogi, the accused bailiff from the DL-6 Incident. 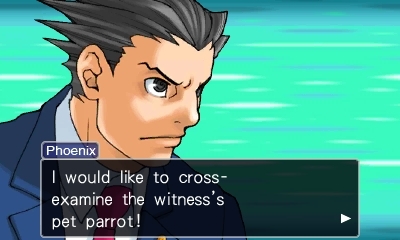 The cross-examination of Polly the parrot proved to be critical testimony for the defense. Thanks to the testimony of Polly, Yanni Yogi confessed to the murder of Robert Hammond — as revenge for ruining his life due to the DL-6 Incident. The insanity plea used by Hammond, while getting Mr. Yogi a Not Guilty verdict 15 years ago, resulted in him completely changing his life and feigning insanity. His wife, Polly Jenkins, committed suicide shortly after the DL-6 Incident. Mr. Yogi also identified Miles Edgeworth as ruining his life, and so he wished to frame him. Mr. Wright was able to prove, after 15 years and on the day the statute of limitations would end, that Manfred von Karma, not Yanni Yogi or Miles Edgeworth, was the true killer of Gregory Edgeworth in the DL-6 Incident. 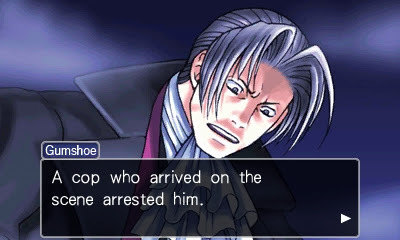 While Miles Edgeworth did end up launching a bullet from a gun, it did not go into his father but, rather, Manfred von Karma, who was still in the courthouse. The bullet was lodged into Mr. von Karma's shoulder all of these years. After being shot by Miles, Mr. von Karma fatally shot Gregory in the elevator and took a six-month vacation. 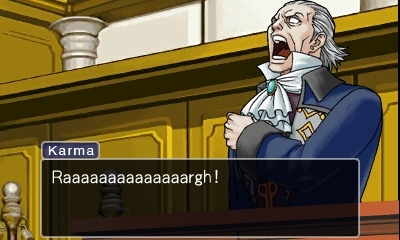 Manfred von Karma clutching his shoulder, where the bullet still resides. It was also revealed that Manfred von Karma was behind Yanni Yogi's murder of Robert Hammond, and the prosecutor had orchestrated the entire plot. Manfred von Karma will be executed soon by the state of California. 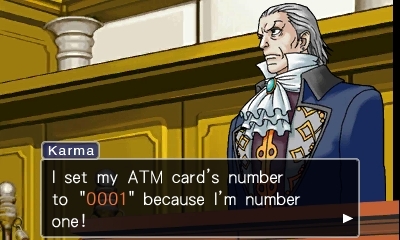 In the meantime, Mr. von Karma openly revealed his ATM card's pin number in court. Is his bank account disabled, or is the money up for grabs? What legal ramifications do you believe this historic set of trials will bring to the American legal system? Will Mr. Wright's heroic defense inspire a new generation of defense attorneys? Is there corruption within the Los Angeles prosecutor's office? Compare this to KoopaTV's coverage of another Los Angeles incident, a mass murder, and its courtroom resolution also featuring Miles Edgeworth, but as a prosecutor. Polly the parrot was celebrated as a top bird on KoopaTV. If you wish to play through Turnabout Goodbyes for yourself, and fully appreciate the many details this news report glossed over, you can play it as part of Phoenix Wright: Ace Attorney Trilogy which is on sale until January 4. Ludwig used this incident as an analogy for George Zimmerman. Phoenix Wright and Miles Edgeworth return in court two months later, to undo that mass murder conviction at the top of these related links. 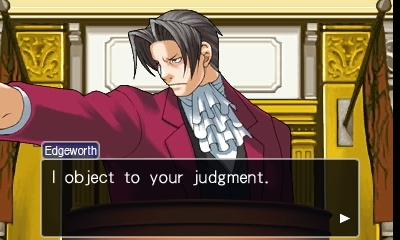 This case lead to Miles Edgeworth wanting to die. The rookie defense attorney somehow managed to solve another mystery while convicting one of the greatest prosecutors of our generation. Just wait until the Chief Prosecutor hears about this. The whole department will never be the same again. Glad I'm not living in Los Angeles right now, though I'd like to hear from people that are. Um, I don't think the Los Angeles this happened in is the same Los Angeles that this blog reaches. From what I've seen, it's a lot more...Japanese. Pretty sure we're dealing with some kind of parallel universe shenanigans here. I've never been there myself, but it's gotta be the same one. As much as I'd love to refute you...I've never actually been either. >_< But I could swear I've seen like, a TV show with what's supposed to be a realistic setting set in California and it wasn't nearly so Japanese. Granted it was PASADENA California, not Los Angeles, but still! A TV show? You can't trust those to be right! The media distorts things all the time. .......Of course, KoopaTV's own investigative reporting is exempt from that condemnation.